At Martech Communications, Inc. we pride ourselves in our ability to offer our customers a wide range of flexible and cost-effective services. Established in 1989, we have gained years of experience in INSTALLATIONS, REBUILDS AND SPECIAL PROJECTS, specializing in analog and digital video installations. Whether it's installing basic set top converters, upgrading to newer digital receivers, or even just running additional outlets, Martech Communications, Inc. is fully equipped and qualified to handle any cable installations. In today's high-tech world, we are continually challenged to keep pace. 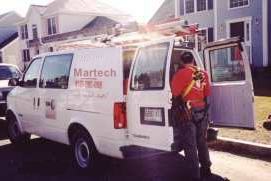 Communications providers often find it difficult to maintain existing infrastructures let alone keeping with new installations.. With Martech Communications, Inc. on your team you would not have to commit any of your own resources to special projects in order to maintain or upgrade your systems. Martech Communications, Inc. will help plan and execute any system project you may need to get the job done, such as Audit's, CLI, Disconnects, Filter or Trap install or removal.